Microsoft's lineup of OEM partners for Windows Phone 8 devices launching in October include Nokia, Samsung, and HTC, but the software giant may again be getting in on the hardware game. Introducing a Microsoft-branded smartphone could be a way to jumpstart Windows Phone 8 in a crowded mobile OS marketplace, though it wouldn't necessarily represent a takeover of the hardware business enjoyed by the company's partners. The move, first reported by BGR care of unnamed sources, would be along the lines of Microsoft's Surface launch. In a lead-by-example approach, the company is releasing its own Windows RT-running tablet later this month. Adding to the speculation, a separate source has reportedly told China Times that Microsoft is planning to launch a "Surface" branded smartphone. 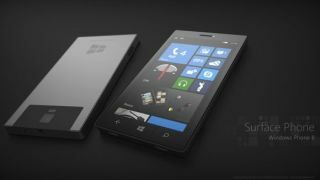 A Microsoft-branded smartphone running Windows Phone 8 is still unconfirmed, but the strategy rang a few bells for analysts like Wayne Lam. "Microsoft diving into this really makes sense," Lam, a senior analyst at IHS iSuppli, told TechRadar. "We've seen Google take an interest in creating Nexus devices. They're there to create a new example, a new device, and new form factor." However, Lam agreed with the popular sentiment that Microsoft's hardware interests stop there. "They wouldn't be doing it to steal market share away from Samsung or HTC," he added. "They'd be doing it to showcase what the platform can do." "Microsoft has traditionally not been a hardware company," Lam said of the company's 37-year history. "But they're getting into a space where they have to set a hardware agenda." It looks as if Microsoft's "hardware agenda" won't be fully realized until next year, though. The Microsoft smartphone isn't expected in the first round of Windows Phone 8 devices, a second source told BGR. Instead, there'll be five phone running the mobile OS at launch, and all are by key Microsoft partners: Nokia Lumia 920, Nokia Lumia 820, HTC Windows Phone 8X, HTC Windows Phone 8S, and Samsung Ativ S.
This gives Microsoft's OEM partners ample time - and the holiday season - to introduce their own Windows Phone 8 hardware.